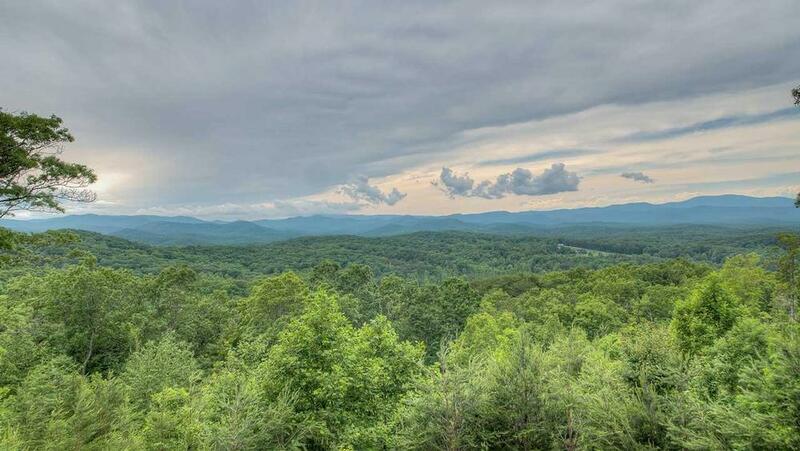 Located in the popular Sun Rock Mountain neighborhood, Cohutta Sunset View's unobstructed views overlook the Cohutta Wilderness mountain ranges. 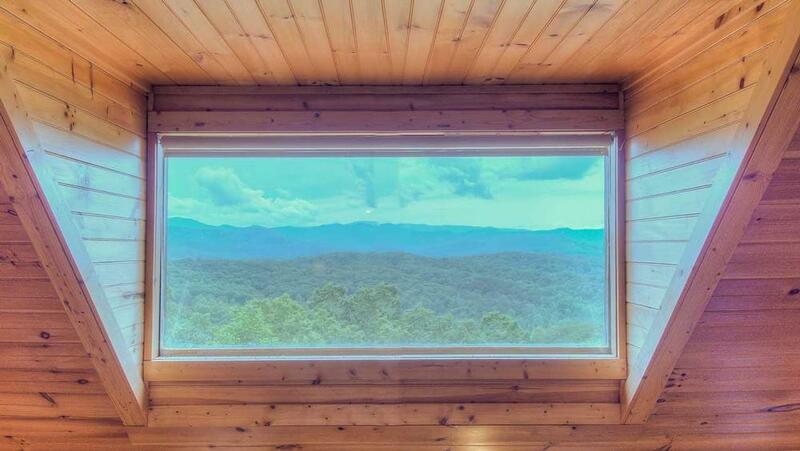 The first thing you will notice is views, views, views outside every window. 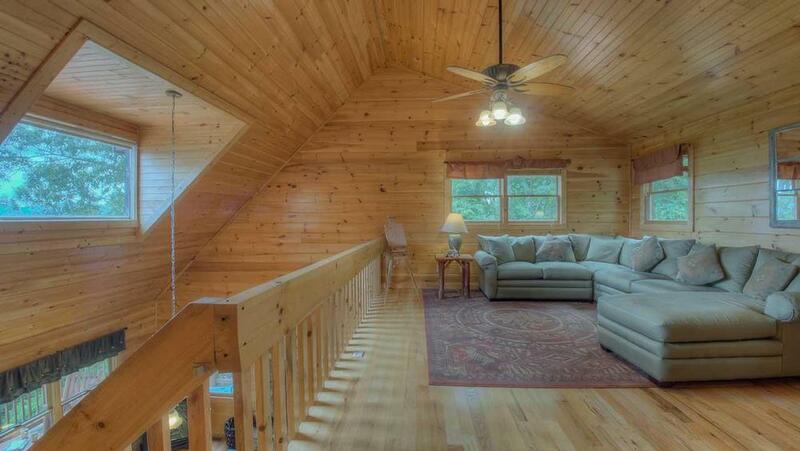 However, the views inside will give you that great mountain vacation feel as well. Cohutta Sunset View's charming rustic decor features a wildlife & bear theme, with thoughtful touches throughout, such as an antler chandelier and decorative canoe paddles. 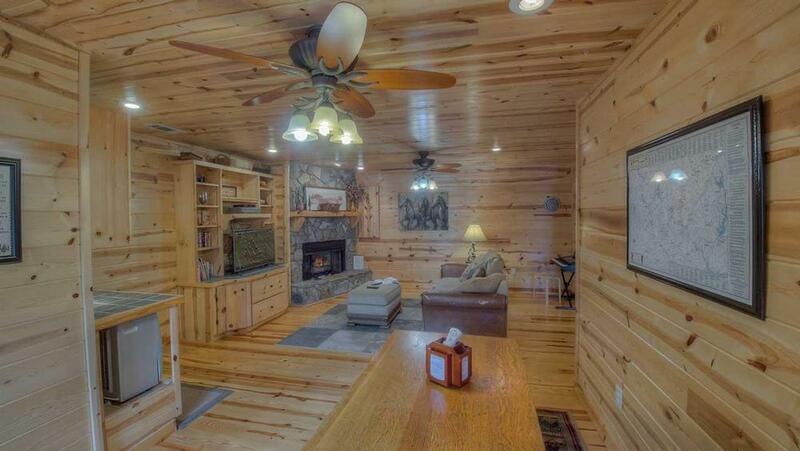 On the main floor, everyone can gather around the wood-burning fireplace on comfy leather sofas to watch TV. 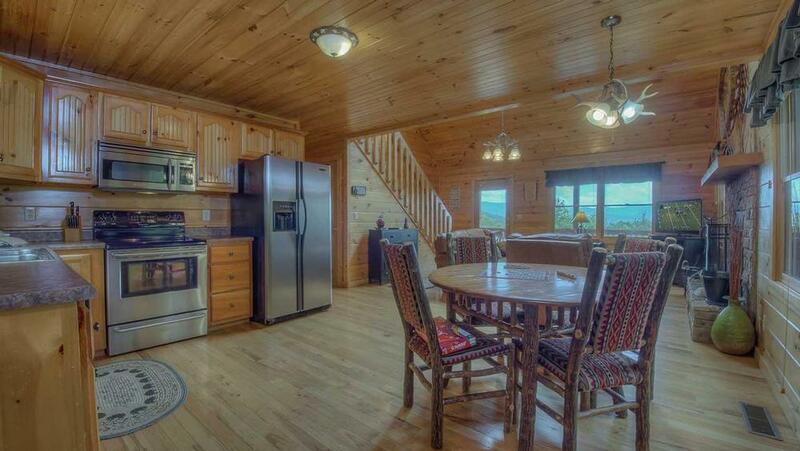 And the adjacent kitchen makes preparing meals easy as a mountain breeze, with stainless steel appliances, coffeemaker, espresso machine, and crockpot. 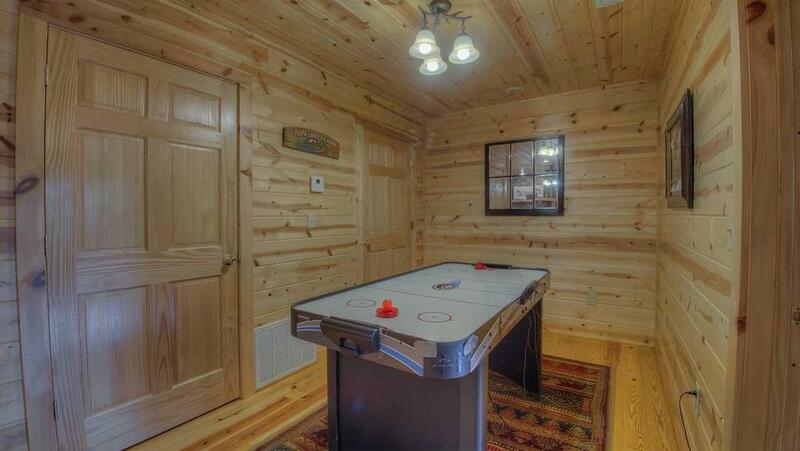 The lower level's 'bear den' offers a plush chenille sofa and chair for snuggling up by the fireplace, and young cubs can tussle at the air hockey table or grab a snack from the mini-kitchen. In the loft, you'll feel as cozy as a hibernating bear, curling up with a book from its reading library, and the micro-suede sectional converts to a full-size bed. There's a built-in desk with WiFi, so even if you are doing some work or surfing the 'Net on your laptop, you can still enjoy great views through the loft's windows. Even in the mountains, life is easy. On the upper deck, enjoy a laid back lunch or grill some burgers for dinner. 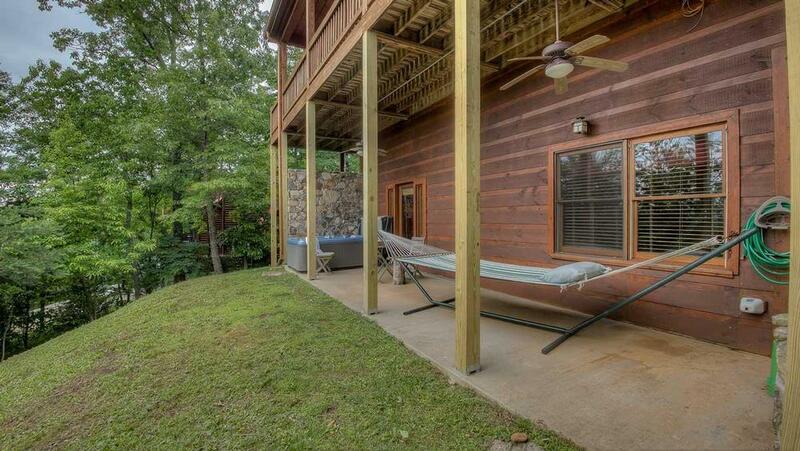 Head down to the lower deck for a relaxing soak in the hot tub or a snooze in the hammock. 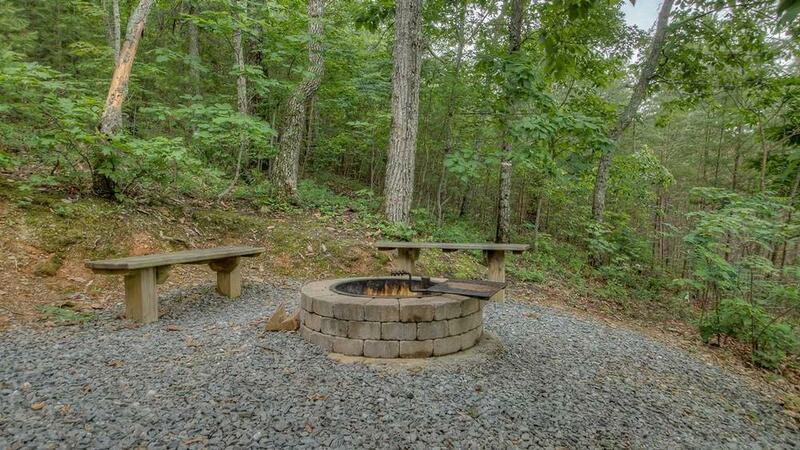 The fire pit is the perfect place for stargazing — and perhaps a glimpse of wildlife. 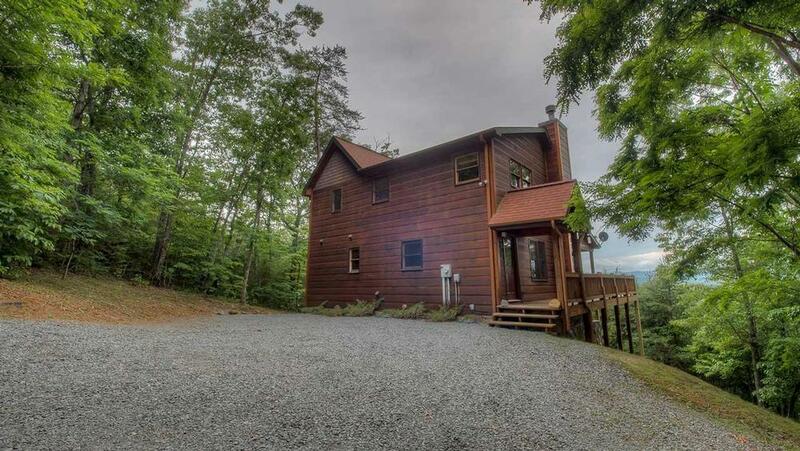 All three bedrooms boast sweeping mountains views, and are on different floors for added privacy. 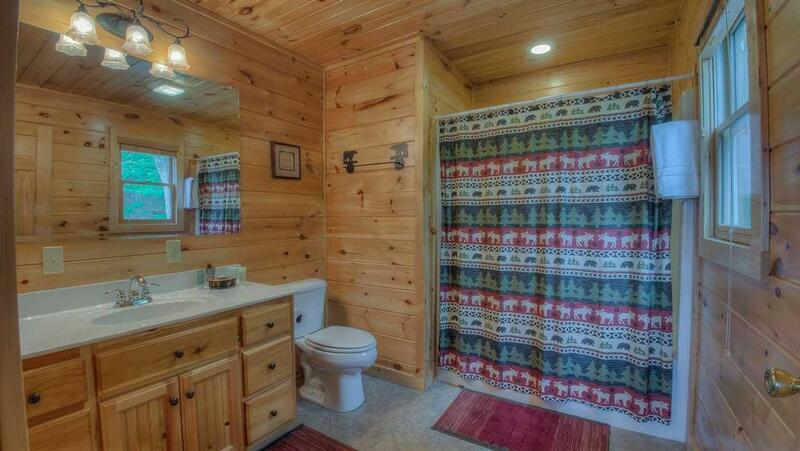 The upstairs master and main level queen bedroom have private bathrooms. 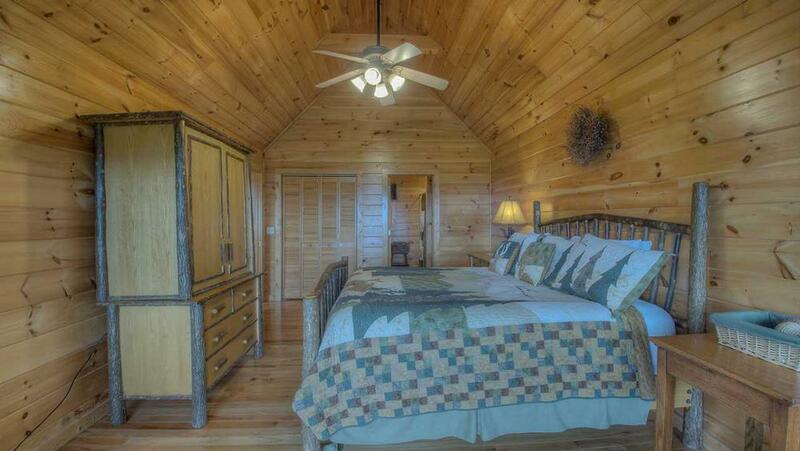 The master also features Old Hickory furnishings, a nature-themed quilt and its own balcony. 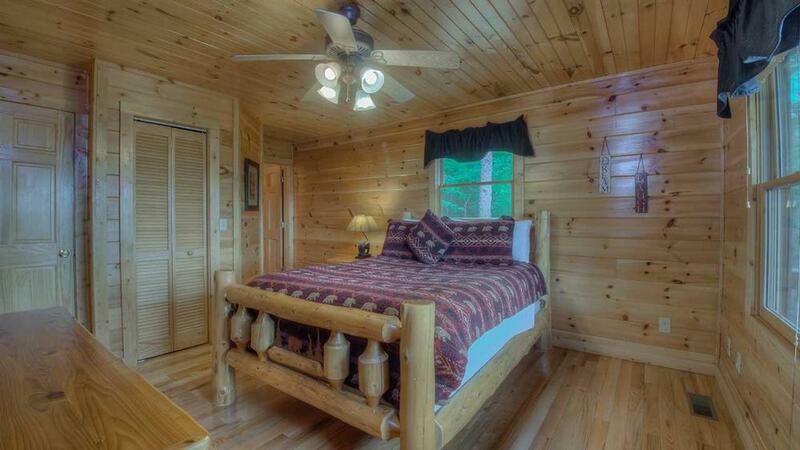 The queen bedroom has a log bed with a wrought iron wildlife design inset and bear-themed coverlet. 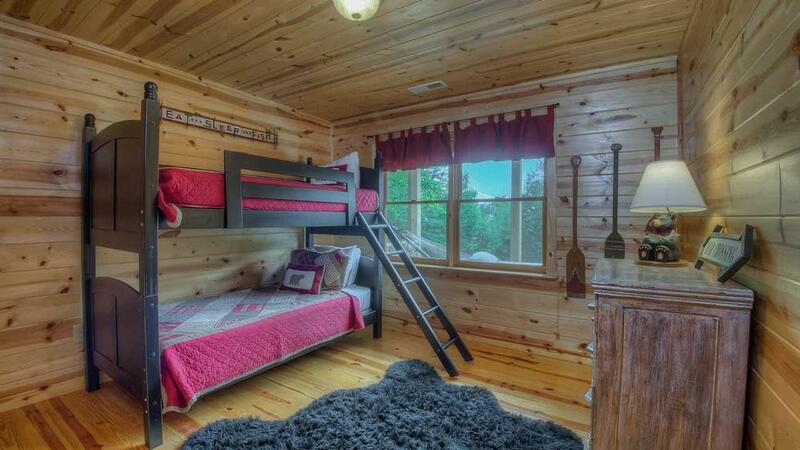 Kids will love their room's bunk beds and outdoorsy accents. 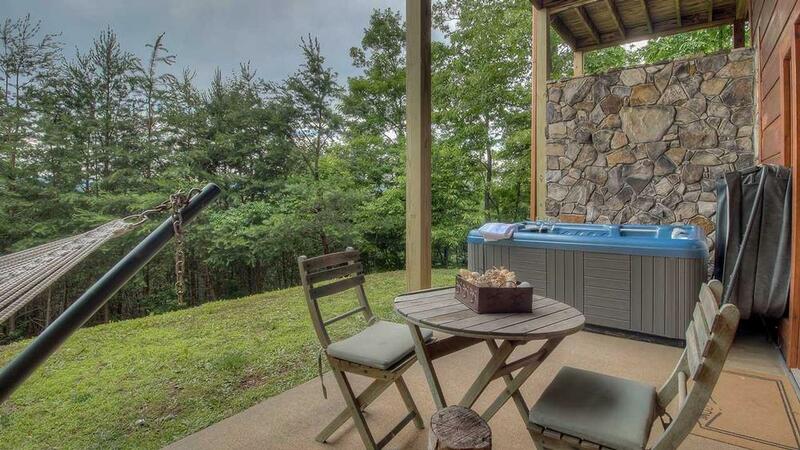 In fact, Cohutta Sunset View's is perfect for families with young cubs, offering a Pack 'n Play, high chair, booster chair, baby & toddler toys and books, retractable child gates at the top & bottom of the stairs, and child-proofed outlets. 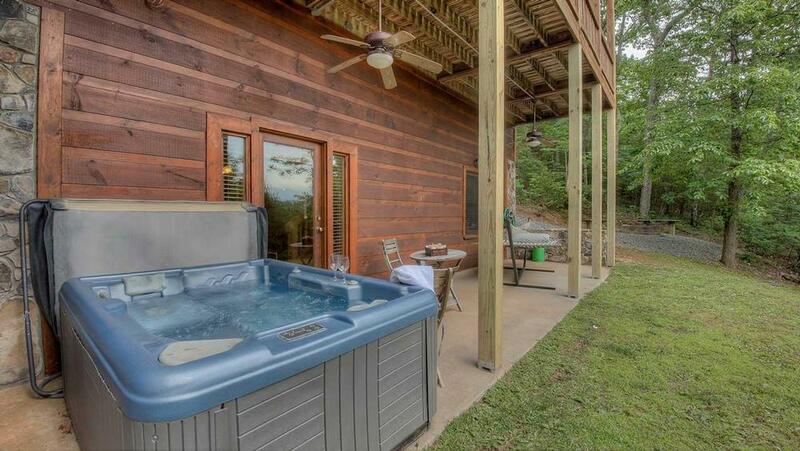 While the North Georgia Mountains are a world away: Relaxation is king, and having a good time is paramount. 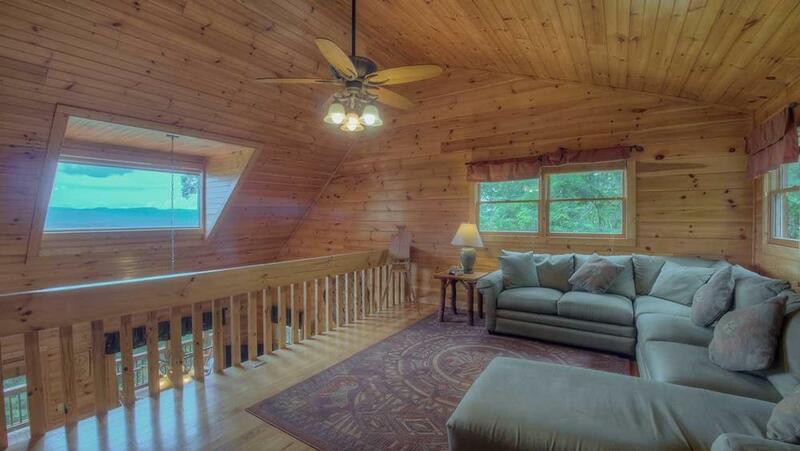 You and your guests will feel right at home in the warm, laid back surroundings of Cohutta Sunset View. 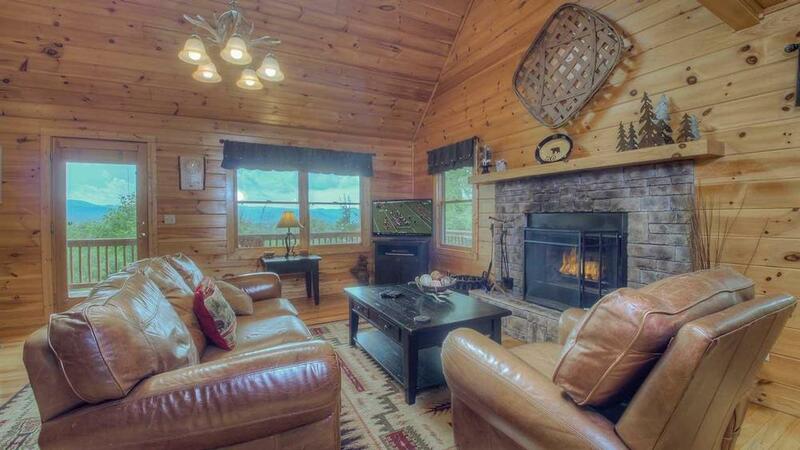 11/18 - We loved the fireplace, the view, the porches, the equipped kitchen, spacious bathrooms and comfortable couches. Well organized, responsive, and extremely easy to work with, thanks!! 10/18 - The view was really great. The home was comfortable and close to town. The company is wonderful and I will continue to use them for all of my mountain vacations. 09/18 - The view was incredible. Easy access and close to town. The home was huge and beautifully decorated. The company is very good. They even arranged rental for the same day I called. 05/18 - The view was amazing and made our stay. 3/18 - Loved the view and the quiet. Wonderful company! 07/17- The home is beautiful and spacious. 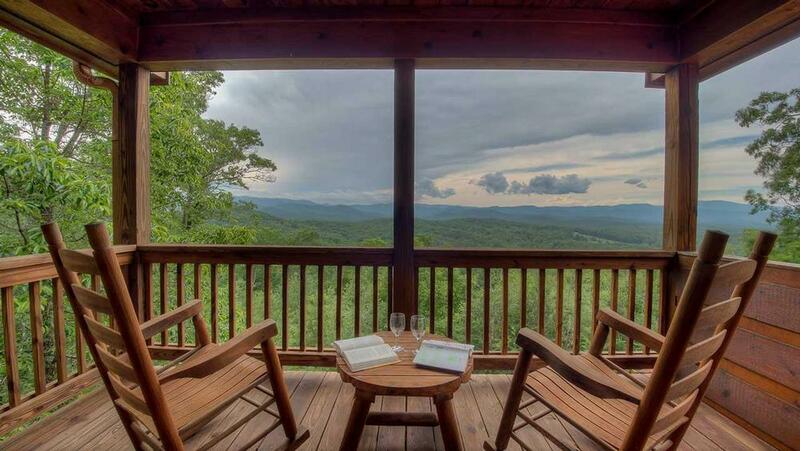 Gorgeous view from the porch. Close to town. The company is easy to work with and the rental was as advertised. 07/17- Loved the architecture, floor plan, decor, pine interior, location, views, decks and children's accessories in the home. Professional and delivered as advertised. 04/17- We enjoyed the space and the view. Good location close to town. 03/17- We really appreciated that you guys thought of everything for us. The little gift bag on the table was a really nice surprise. We loved all the games you had available and the books and movies. You really thought of everything. One word.......AMAZING!!!!! 03/17- So many great areas to visit/spread out! Loved the gate on the deck (helped contain dogs and kids). Lovely view, two fireplaces, quiet neighborhood, house in great condition. 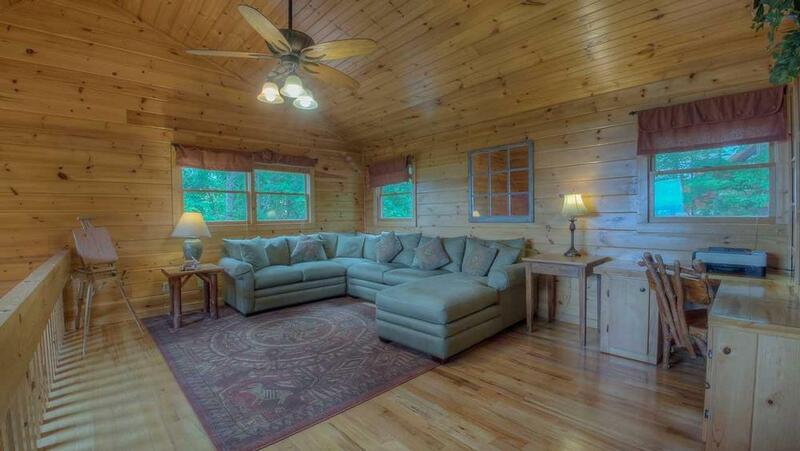 It should be clear after our multiple rentals with you that we're huge fans of Escape to Blue Ridge! 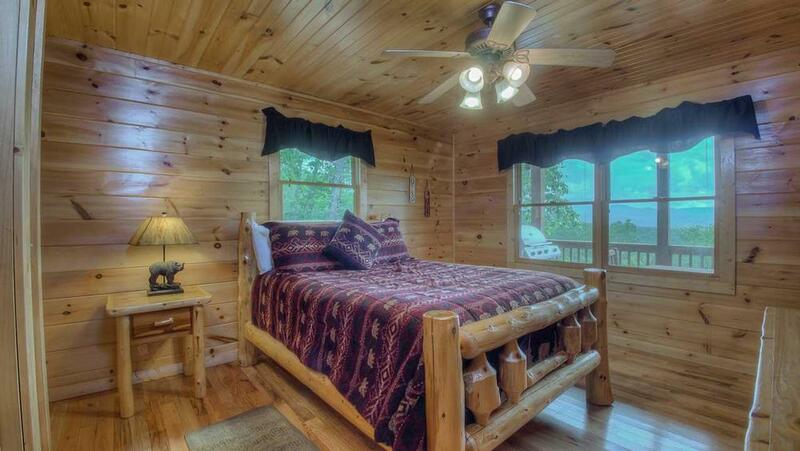 We always have a great experience in terms of customer service and cabin selection. We'll be back! 11/16- Very clean and stocked with about everything needed. All instructions sent by email were good. Easy to get hold of someone when we needed assistance. Surely would recommend to others. Thank you for the stay. 10/16- Our favorite features of the home were the view, the interior "cuteness" and comfort, the cleanliness and overall upkeep. Incredibly easy to deal with and to conduct the transaction. And I loved how well-kept the house was. We were appreciative of all the little details. 09/16- The hot tub when it was raining was amazing! We cooked on the grill so that was nice, and the view was the best! I have used Escape to Blue Ridge twice now and they are great! 08/16- Everything was as described. 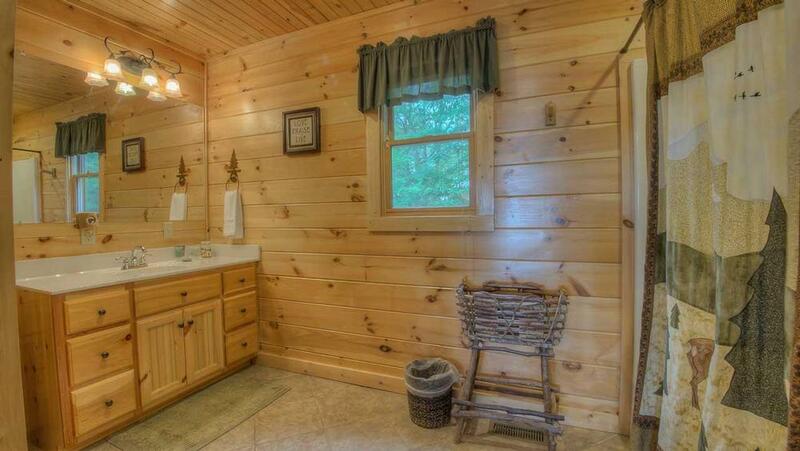 Clean, perfect family size - great place to relax. The view is amazing. All of the amenities were great! Great customer service! Responsive and trustworthy. We loved the welcoming packet we received as well as all the detail left in the house. 09/16- The view was as described and was very beautiful. The house had plenty of room and all of the amenities we needed. My interaction with email correspondence and phone conversations with the staff were very good. I was left with a very good impression. 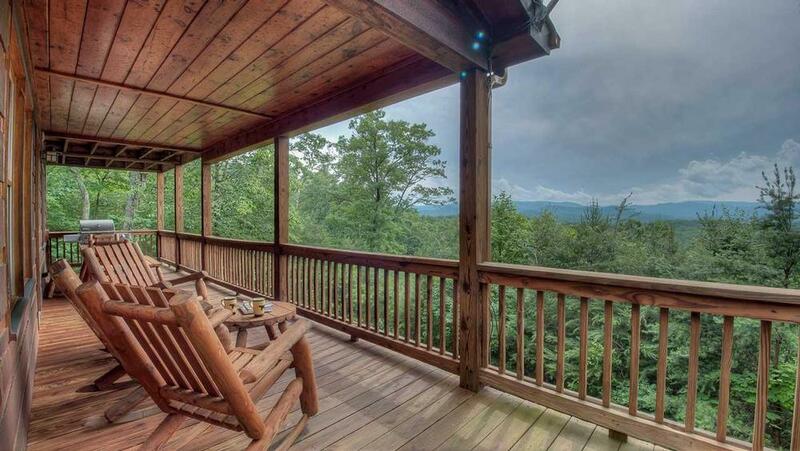 08/16- Cuzzy Cabin has the most amazing view! Having breakfast in the balcony and spending time in the game room was truly a joy. Home is so well equipped. Friendly and professional. So easy to work with and loved the detail at our arrival to the cabin to have the lights on and background music playing. 06/16- The lay out way perfect and everyone had their own private restroom. 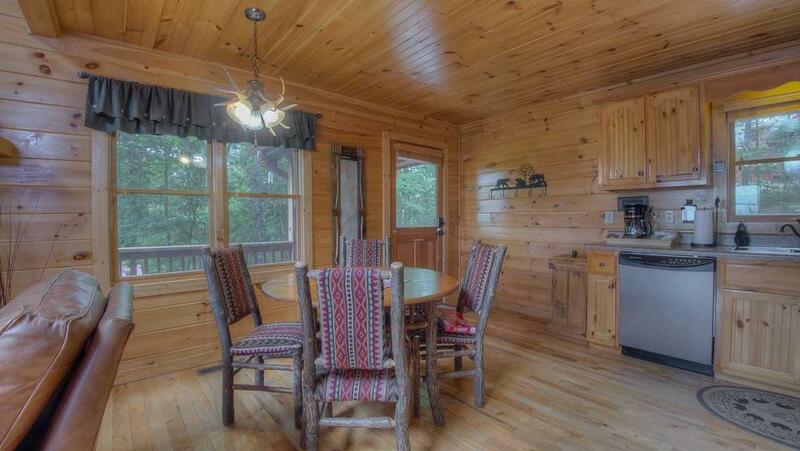 The Cabin was just beautiful and the views great taking. I would call and reserve with you again. We were pleased. 06/16- We enjoyed the fact that mostly everything was provided for us even though we brought extra stuff, we didn't have to use much! 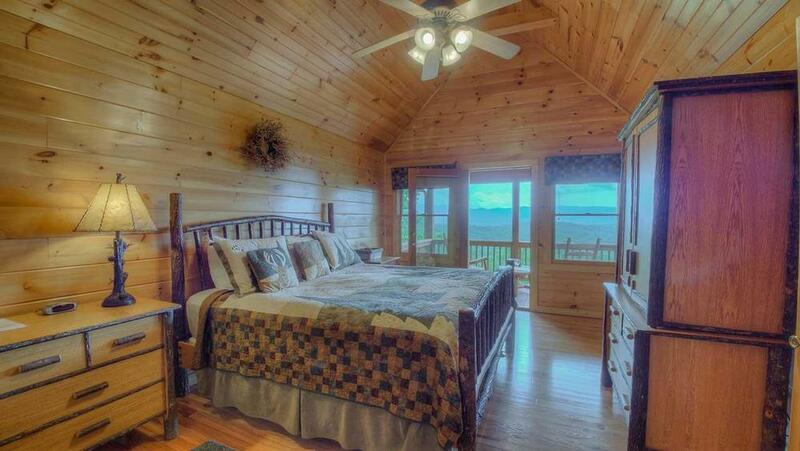 Very nice cabin, spectacular views, thoroughly enjoy our stay! 05/16- The view is fantastic. This was our 4th trip reserved through EBR and we will continue to use EBR for our return trips. We absolutely love the area. 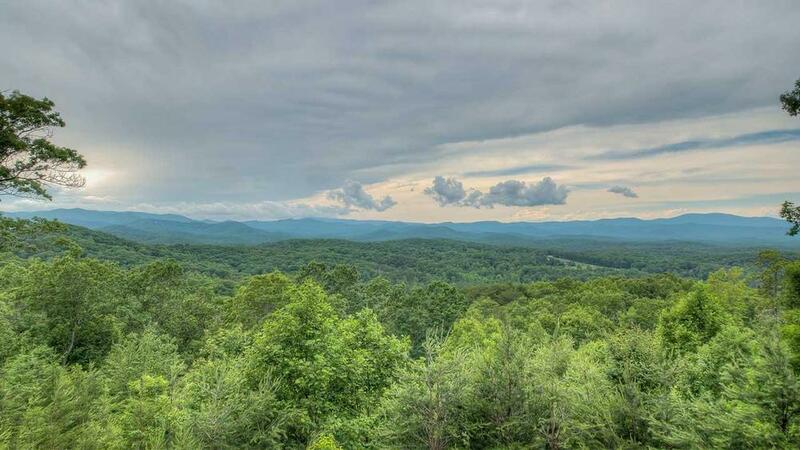 04/16- Gorgeous view; great games, puzzles, books, toys for children; hot tub; fire pit; adequate provisions; ample bathrooms; comfortable beds. 03/16- I enjoyed the space and kid friendly environment of the home. Also loved the location. 11/15- The view was great.Best location and super clean. 09/15- Gorgeous views. Comfortable and clean home. I like how simple it is to rent from your company. The facts are straight forward. 09/15- We really enjoyed to view, and lay out of the home. Very spacious! 08/15- The views and the jacuzzi. Solid company! 07/15- We loved the mountain views. 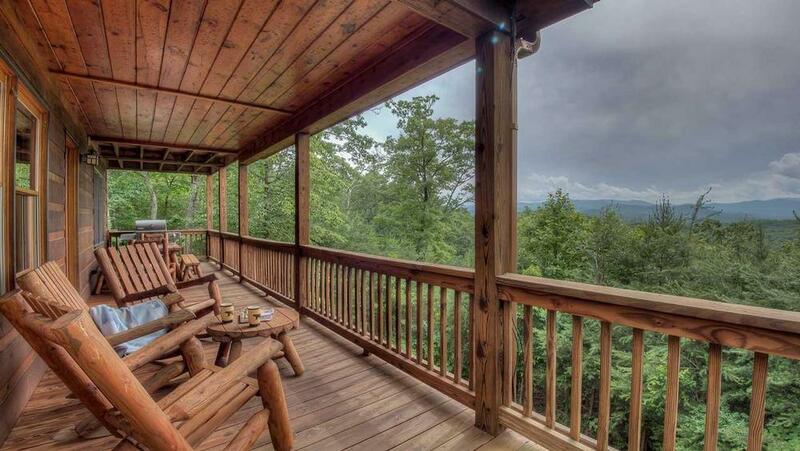 We ate dinner on the main porch every night, while watching the beautiful mountain sunsets. 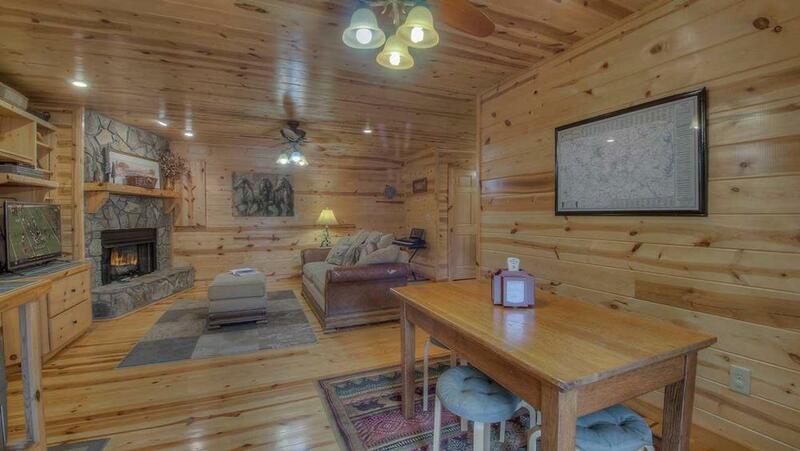 The cabin was close to town, activities, and shopping. 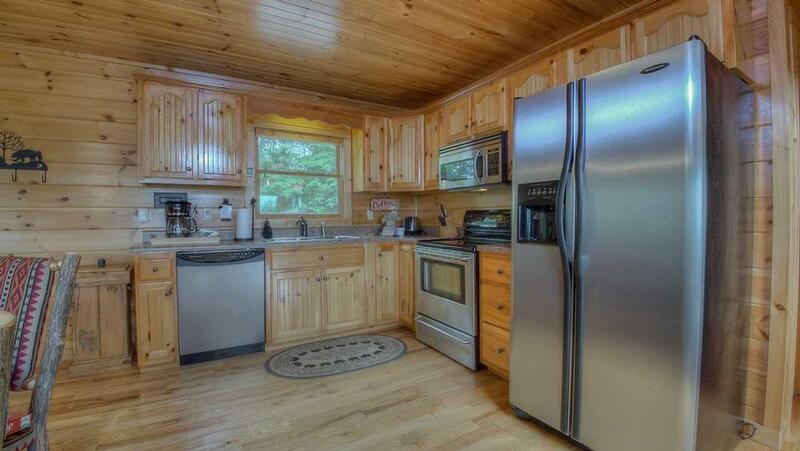 The cabin was very well maintained and had toys for the kids. The company was very friendly and helpful. We were last minute guests and really felt like they did an excellent job accommodating our family and giving us any information we needed about the area. 07/15- The mountain view and the sunsets were incredible. 06/15- The view is amazing! The pictures really do not do it justice. We really appreciated all of the items for children, such as toys, books, baby gates, high chair, etc. 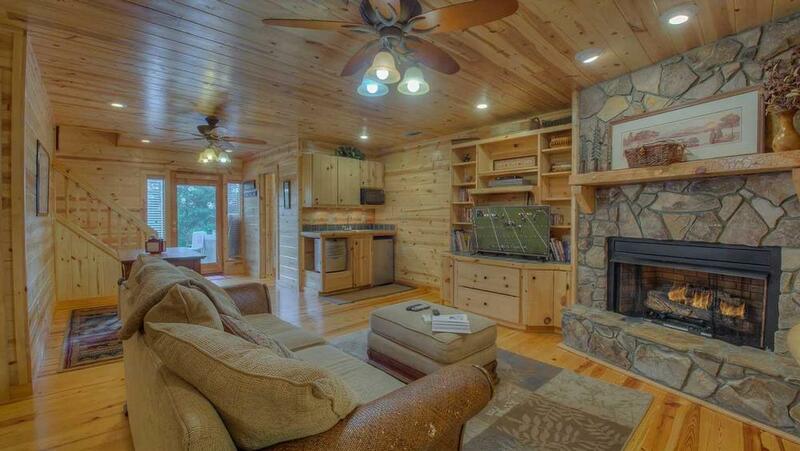 Very nice grill and the televisions have been updated since the pictures on the website as well. Was very pleasantly surprised by the whole cabin! 06/15- Very clean, nice view, good location. We enjoyed our stay. 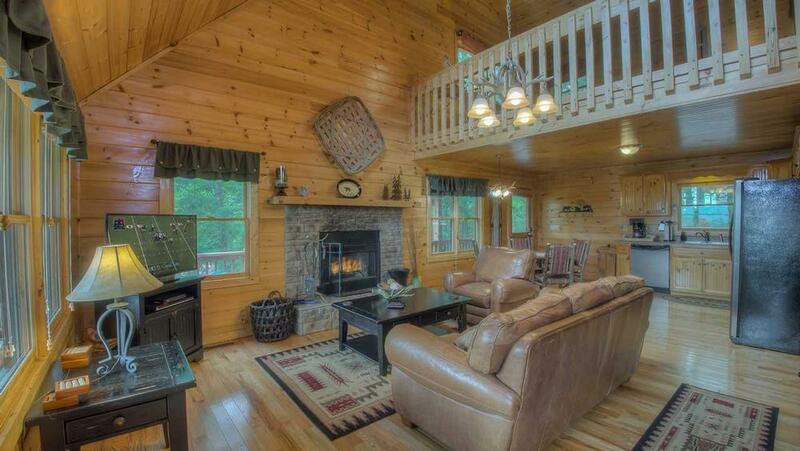 03/15- We loved the location of cuzzy cabin , very well maintained. Overall it was a wonderful experience. Seems like you really cared for your guests! 02/15- The game room is downstairs away from everything and the master bedroom is upstairs away from everything; plenty of bathrooms. The layout is great! We loved it! 01/15- The view! The home was gorgeous and I loved being able to go straight to the cabin and use the code to get in after driving 8 hours to get there. It was much easier than going to an office first and then traveling further to the cabin. The kids loved having their own little "mini apartment" on the bottom floor as well. 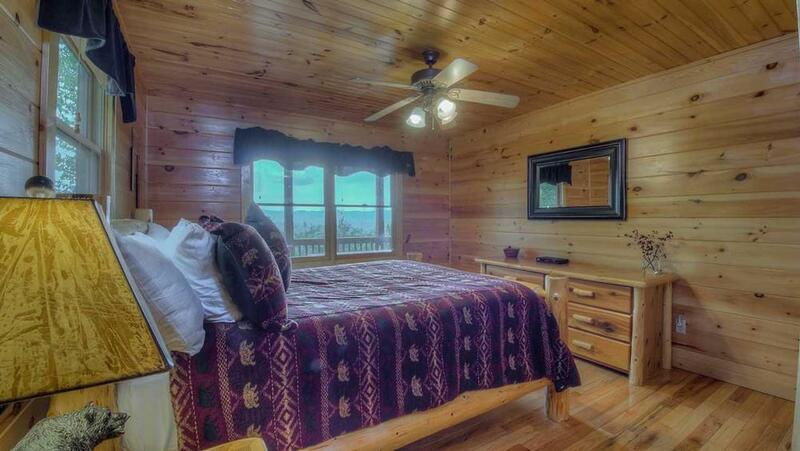 The area was gorgeous, the view was amazing, and the cabin was close to all the attractions. 11/14- Fully equipped with everything you may need and more. Clean and spacious with top-notched furnishings. VIEWS, VIEWS, VIEWS. Snowed first 2 days. Sunsets were unbelievable. 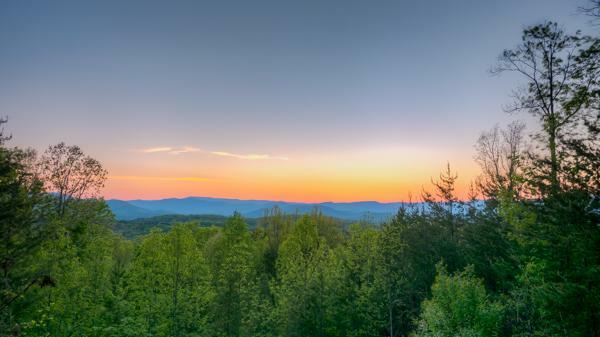 If relaxation, peacefulness, and spending time together is what you are looking for, then Escape to Blue Ridge and grab some serenity. 10/14- The view, fireplaces, downstairs area for kids were the favorite features. 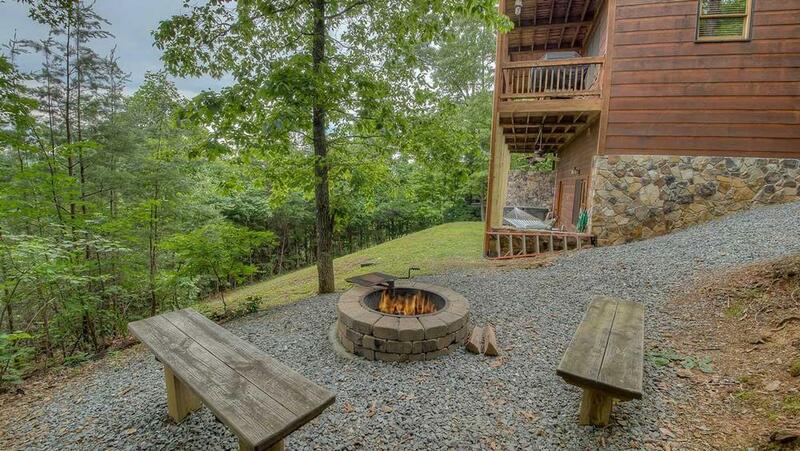 10/14- Views, fireplaces, fire pit, close to town, everything was nice and clean and well stocked. Great family getaway! Everyone loved it. 10/14- The view is great! 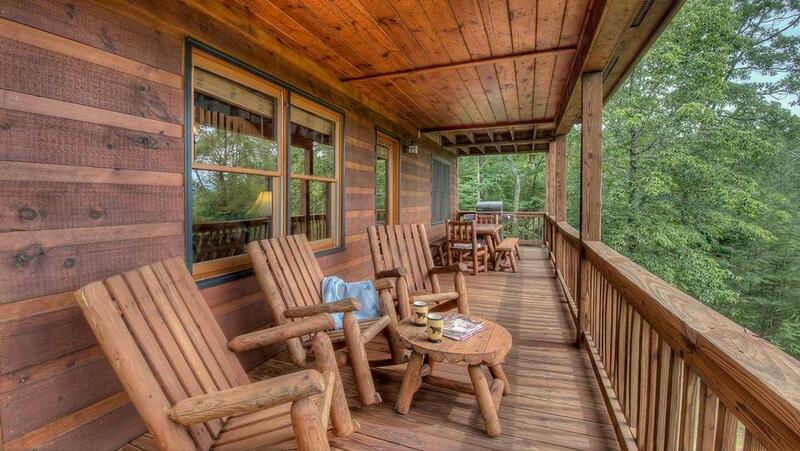 beautiful cabin and location. 10/14- Decorations, home design,hot tub were awesome. 09/14- Without a doubt- the view of the mountains was a great feature! Yours was better than Southern Comfort cabin rentals- and your book of places to go and things to do was a great help. 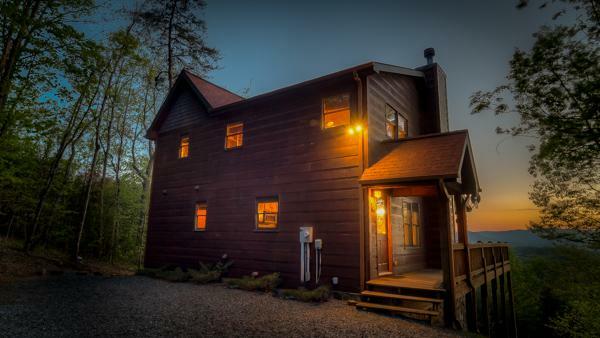 Felt like a real family home, loved the extras like books, games, toys, the kids loved the keyboard, and the easel and crayons, and for these reasons we would definitely return to this cabin in the future. 08/14- The seperate areas on each floor and the porches.